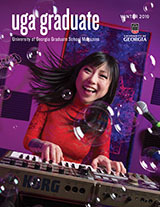 Many degree programs within the University of Georgia offer financial assistance to students seeking a major within their department. Information regarding these departmental awards may be found by visiting the departmental websites. The following financial assistance is managed through the Graduate School. Nominations must come from your graduate coordinator. This prestigious, highly competitive award began in FY 2000-2001 with the intent of recruiting exceptionally qualified students to our doctoral programs. The nominations for this award are presented to the Graduate School by individual departments in late January. This award is guaranteed for five years of support contingent on satisfactory performance and progress toward degree completion. A maximum of six awards are made annually. The annual stipend for the Presidential Graduate Fellow is $27,000 per year (1st year – $23,625) with a reduced matriculation fee of just $25 per semester and fees of $1,135 per semester (as of Fall 2016). The student must be fully engaged in graduate studies and may not hold any other employment. In addition to being engaged in research and graduate studies on a full-time basis (12 months), each recipient is expected to participate in special activities which are designed to enhance their professional development. Such activities include (1) the participation in a monthly discussion group with other Fellows and selected faculty members to discuss issues that add value to the University and the student’s education and (2) a class in the responsible conduct of research, and (3) development and submission of an individual development plan (IDP). In recognition of its leading role in the generation of new knowledge in our country, the University of Georgia is classified among the 115 “Doctoral Universities: Highest Research Activity” in the 2015 Carnegie Classification of Institutions of Higher Education. This classification recognizes two important things: (1) the predominance of UGA in research and scholarship and (2) the vital role that doctoral students play in sustaining and growing the research mission. To further enhance these two intertwined strengths of the institution, the Office of the Provost announces the Georgia Research Education Award Traineeship (GREAT) Program. GREAT Fellows will be selected from among applicants to UGA doctoral programs, in selected disciplines that enhance or develop areas of research/ scholarship strength. Beginning in January 2017, designated programs will be asked to nominate GREAT Fellows, nominations will be reviewed centrally, and 10 GREAT Fellows will be appointed each year. GREAT Fellows will be chosen from the most outstanding nominees who demonstrate superior potential to be productive and successful researchers in areas of need that complement/ support the research and scholarships strengths of the university. Maximizing competitiveness to recruit these outstanding students, assistantships for GREAT Fellows will be awarded by February 15 of each year. GREAT Fellows will be hired as graduate research assistants, with $27,000 compensation and tuition waiver. These assistantships will be renewable for up to five years total support (pending adequate progress towards the degree and continued funding from the State of Georgia), with the first three years of support coming from central administration and the last two years from the student’s school or college. The State of Georgia depends on an educated, technically skilled workforce to compete in the global marketplace. To be successful in an increasingly competitive job market, many students require additional skills sets beyond those learned during undergraduate studies. To address these interrelated challenges, the University of Georgia announces the Georgia Impact Now Master’s (GAIN) Fellows Program. GAIN Fellows will be selected from applicants to UGA master’s programs in specific disciplines having a high impact on the economy of the State of Georgia. Beginning January 2017, designated programs will nominate GAIN Fellows, nominations will be reviewed centrally, and 10 GAIN Fellows will be appointed each year. GAIN Fellows will be chosen from among the most outstanding nominees, who demonstrate superior potential to contribute to the economy of Georgia after completing their degrees. Maximizing competitiveness to recruit these outstanding students, assistantships for GAIN Fellows will be awarded by February 15 of each year. GAIN Fellows will be hired as graduate research assistants, with $20,000 12-month compensation and tuition waiver. These assistantships will be renewable for up to two years total support, pending adequate progress towards the degree and continued availability of funding from the State of Georgia. Doctoral assistantships are awarded each year on a competitive basis following a highly qualified student’s nomination by their major department or school. A faculty panel evaluates each nominee. The doctoral assistantships are available to doctoral students in their final year of study. These assistantships allow the student to devote time to the completion of their dissertation. At the completion of the assistantship award, the student is expected to have finished the dissertation and graduated. For research grants that include the cost of full-time in-state tuition for graduate research assistant(s) in the funded award, the University will return 1.5 times the tuition funds to the Principal Investigator’s home department. These funds must be used to cover the cost of an assistantship for additional Ph.D. student(s) (not tuition). The university’s portion of any new assistantship’s cost of benefits would also be covered centrally by UGA. For additional information, please review the RIAS description and related documents. GSRA block grants are used to support incoming Ph.D., MLA, MHA or MFA students. Graduate School Research Assistantships are awarded to highly qualified students and provide a 4-year support package for selected students. As shown in the table below, the Graduate School provides support for an incoming student in year 01 of training, the school/ college/ institute supports the student in years 02 and 03 of training, and the Graduate School supports Ph.D. students again in year 04 of training (assuming they have advanced to candidacy; only one year of support for PhD, MFA, MHP, or MLA students). For the entering class of Fall 2019, the Graduate School will provide $24,258 per slot, which can be used to support more than one recipient, with the understanding that year 04 support will only flow to students who were supported in year 01. In years two and three, schools/colleges/institutes are welcome to supplement this amount. However, they must pay at least the minimum amount of $24,258 to one student, through the mechanism(s) that best suit their needs. In year four, the Graduate School will provide $24,258 to support the recipient’s as a Graduate Research Assistant, assuming he/ she has advanced to candidacy. The Graduate School awards a limited number of out-of-state tuition waivers to degree-seeking domestic students who are classified as non-residents for the state of Georgia through the Board of Regents’ Research and Comprehensive University tuition waiver program. The Regents’ Research Out-Of-State Tuition (ROOST) awards are based on applicants’ academic performance and the recommendations from their graduate coordinators. The waiver lasts for one academic year and is renewed each term of that academic year, contingent upon recipients earning at least a 3.00 graduate grade point average based on twelve hours of graduate course work in the fall and spring semesters and nine hours of graduate level coursework during the summer. These awards waive only the non-resident portion of the student’s tuition. Students interested in being nominated for this award should contact the graduate coordinator of their major department. Being nominated does not guarantee receipt of a waiver. Students must have a 3.5 GPA to be nominated the following year. ROOST waivers previously awarded by the Graduate School to international students will now be awarded by the Office of International Education. For more information of this award process, please contact the Office of International Education or visit https://international.uga.edu/issis/information-for-sponsoring-uga-departments. Doctoral students who are admitted to candidacy will automatically be granted an out-of-state tuition waiver by Graduate School staff if they do not have an assistantship waiver. The waiver will be effective the semester following the semester in which the student is admitted to candidacy (must be admitted prior to the last day of classes). Masters students who are required to submit a thesis to the Graduate School are eligible for an out-of-state waiver after all courses on the program of study have received a grade with the exception of 7000 (research) & 7300 (thesis writing). A program of study form must be on file in the Graduate School. All students in this category must submit the Application for Waiver of Graduate Out-of-State Tuition to the Graduate School by the last day of classes for the semester prior to the eligible semester.